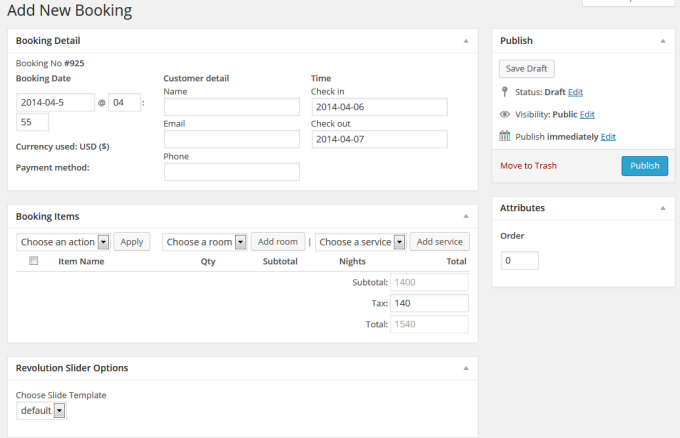 After activating BookingEngine plugin, you can quickly insert some sample data to get to know how it works. Simply click on the button in this Overview page, and visit the other links to modify everything to match your business’s needs. Currently, BookingEngine supports 2 statistical reports: one for revenue and one for booked rooms. Admin can also view these reports in different time ranges. BookingEngine pages: These template pages are added after you activate BookingEngine. If there were errors in the process, you can manually add the pages and assign them to the correct matches. License key: Enter your EngineThemes license key to receive the auto update right in your dashboard. This section will be available in a future version. 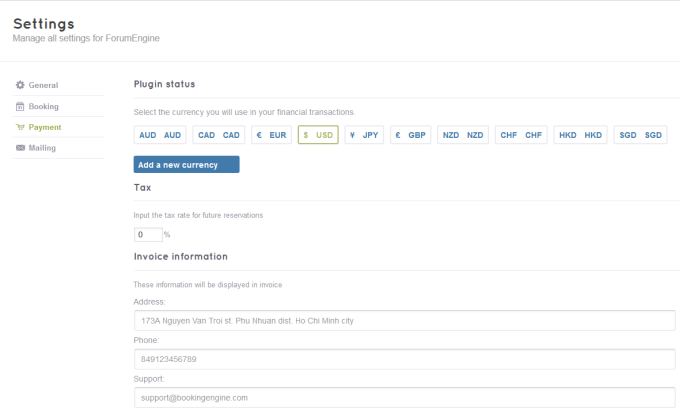 You can configure all settings related to payment here, including different payment methods, currency, tax settings, etc. Currencies: The default currencies supported by PayPal are included. You can also add a new currency, but it might not be supported by current payment methods (Paypal or 2Checkout). Please read Paypal and 2Checkout’s policies to learn more about the supported currencies. Tax: Enter the tax percentage of each invoice. Invoice information: The invoice is displayed after a payment is completed. This information about your hotel will be included in the invoice. Test mode: if you enable the test mode, all payments will not be charged. - Cash: Enter the guideline (e.g. bank account) for your customers to manually send the payment for their bookings. This guideline will be displayed after customers make their booking successfully. - PayPal: Customers will send the payment for their bookings via PayPal payment gateway. - 2Checkout: Customers will send the payment for their bookings via 2Checkout payment gateway. - Stripe: Customers will send the payment for their bookings via Stripe payment gateway. * Note: Before activating a payment gateway, you must first configure the settings required by that gateway. 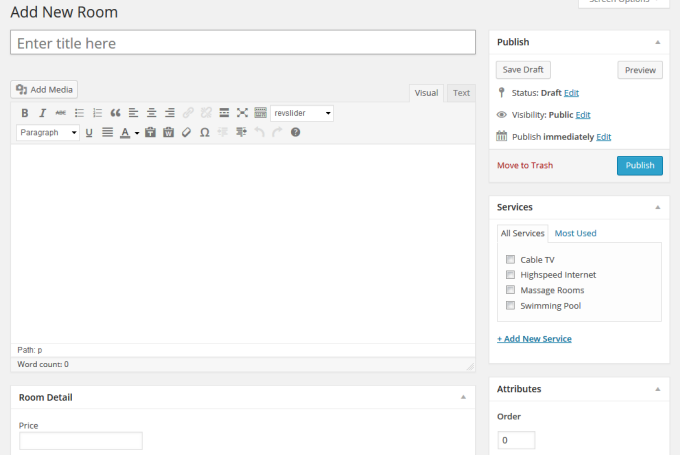 Configure the messages which will be sent to customers. Booking success email: sent to customers when payment for a booking is completed. Booking pending email: sent to customers when payment for a booking is pending and needs confirmation. 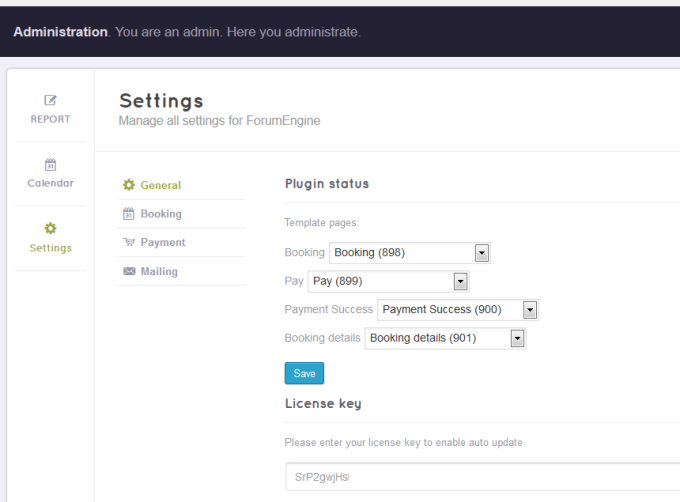 After enabled BookingEngine plugin, all default required pages will be created automatically. You can change them in General settings. The quickest way to get to know how BookingEngine works is to visit the Overview page and install some sample data. Simply click on the “Install sample data” button and sample data for services, rooms & bookings are generated for your review. Go to Services/Add new service in the dashboard menu. Enter the needed information: Name, price, and one time charge (optional). By checking the “one time charge” for a service, its fee will be calculated once for each room in the booking invoice. While “one time charge” is unchecked, the service fee will be multiplied by the number of booking days for each room in the booking invoice. Go to Rooms/Add new room in dashboard menu. Enter the needed information: Room name, description, price, quantity, max occupancy and select the available services for each room. Go to Booking Engine/Settings in dashboard menu. Configure and activate the needed payment gateways. Now your BookingEngine is ready to run. Go to Bookings/All Bookings in your dashboard menu to manage your bookings. The bookings are displayed with basic information in the list for the quick review: booking ID, check-in, check-out, total and booking status. Click on a booking post to view all its details. You can also modify the booking detail here when needed. * Note: You can also manually add a new booking in the backend. This can be helpful for when your customers don’t use your online booking function to make a reservation.